Can Obama Win Russia's Cooperation on Iran? 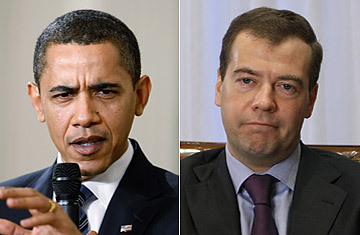 Don't expect President Barack Obama to look into President Dmitri Medvedev's eyes and "get a sense of his soul" when he meets his Russian counterpart on Wednesday at the G-20 summit in London. That was what then President George W. Bush claimed to have done during his first meeting with Vladimir Putin early in 2001, but Obama and Medvedev have more immediate and practical concerns: Washington urgently needs Moscow's help in achieving one of its key foreign policy priorities  containing Iran's nuclear ambitions. But Russia will cooperate only if it's satisfied that Obama has abandoned the more confrontational approach of the Bush Administration toward Iran. According to Russia's ambassador to NATO, Dmitri Rogozin, Moscow will use the Obama-Medvedev meeting as an opportunity to assess how far the new Administration plans to go in pursuit of Obama's promised "new beginning" with Iran. The answer could shape Moscow's decisions with respect to supplying key military technology to Tehran. "All the issues of Iran will be decided on what we have more of in our talks  the hope for peace, or the 'hope' of threats," Rogozin tells TIME. Iran has negotiated an agreement for Russia to supply it with the S-300 surface-to-air missile system, which is far more accurate, and at a far greater range, than Iran's current air defenses are and would greatly enhance Iran's capacity to ward off a pre-emptive Israeli or U.S. air strike aimed at its nuclear facilities. The State Department's key adviser on Iran, Dennis Ross, warned last month that Israel could be tempted to strike before the delivery of S-300 missiles (whose deployment had been expected sometime next year). But, says Rogozin, Russia could hold back on delivering the enhanced air defenses if Obama signals a change in Iran policy. "The best thing that Washington can offer [Russia] is realigning its own attitude with Iran," says Rogozin. Moscow will be encouraged by Tuesday's news that Obama's special envoy to Afghanistan and Pakistan, Richard Holbrooke, met with Iranian Deputy Foreign Minister Mehdi Akhoundzadeh at a conference in the Hague on Tuesday and that the two had agreed to "remain in touch." Rogozin sees Iran's need for missiles as being related to Washington's own stance. "The harsher the U.S. policy is toward Iran, the harsher the response is to the U.S. and the whole world," he says. "If you drive into a corner a small nation, [its people] will do anything they can to protect their security." Yet although Russia has long defended Iran's right to develop its civilian nuclear program, Kupchan claims that officials in Moscow were taken aback when Iran tested a medium-range missile last month. Still, Russia has been unwilling to abandon the S-300 contract. Rogozin indicates that Russia is waiting until "after the first meeting of the two Presidents, and then we will decide on our plans." Besides a new stance toward Tehran, Obama can offer Russia two further inducements to cooperate on Iran: a tacit delay  perhaps for years  in plans to deploy a U.S. missile-defense system in Poland and the Czech Republic, and plans to extend NATO membership to Georgia and Ukraine. Both issues are on the table at this week's NATO summit in France and Germany, although with no link to Iran. Indeed, Iran is not the only issue on which the U.S. and its allies need Russian help: Moscow's cooperation may be the key element in securing alternative supply routes for NATO troops in Afghanistan, given the ease with which Taliban-aligned forces are able to attack the supply lines through Pakistan on which the mission currently depends. Even with concessions on the missile shield and on Ukraine and Georgia, Russia remains deeply suspicious of NATO. "There is still no mutual understanding or trust between us," Rogozin says. "Russia should become a reliable partner to both the U.S. and NATO, but for that, Russia needs to be respected in both Washington and Brussels." Moscow would prefer to reduce the alliance's footprint not only on its southern flank in Georgia and Ukraine but also on its western frontier with Poland and the Baltic states  although any reversal of the integration of those countries into NATO would render the alliance itself meaningless. So the relationship is likely to remain testy, even if it becomes more cooperative. "We are not a naïve people, but we feel a lot of hope," says Rogozin. "We are optimistic."